Thorough knowledge of the list of tarot card meanings is essential, both in order to appreciate the tarot as a whole and to interpret the meaning of specific tarot spreads for particular people and situations. This section includes a list of tarot card meanings (click the screenshot to the right to access it directly). We have described the general meaning of each of the 78 Tarot Cards in a standard deck, each tarot card being featured on its own individual page. Note that this particular list of tarot card meanings is not specific to any particular tarot deck. That is, each deck is subtly different because different themes involve their own particular emphasis and symbolism. Ideally, you should look at the interpretations that accompany the actual tarot deck you are using - though not all supply detailed information about the list of tarot card meanings. One of the most enjoyable ways to explore this subject in more depth, while learning more about the significance of individual tarot cards is by reading books about tarot. You can browse books at many good online bookshops. Alternatively, go along to your local High Street bookstore or make a weekend of it and visit a Mind, Body and Spirit Exhibition where you can browse tarot books in person, ask experts as well as other enthusiasts, and even have a professional tarot reading at the same time. If you find it difficult to get out and about and don't want to wait for tarot books ordered online to be delivered to you you might even be able to download an ebook or find an interesting publication available for Kindle (if you have one). Do I need to know the List of Tarot Card Meanings in order to Read Tarot ? However, knowledge of the list of tarot card meanings is just the beginning. It's a bit like saying that you must be able to read and understand road signs in order to navigate from one unfamiliar location to another - without SatNav, obviously. Certainly you do need to understand what all the symbols, colours and shapes of signs mean, but that alone is not enough. In order to navigate your journey through the countryside and city streets you must also know something about the layout of the area - think of a map as a tarot spread ... you start and progress in a particular way and direction. For example you must be able to understand information in context, such as a "No Entry" or "No Through Road" sign typically meaning that you'll need to re-route at least part of your journey. To complete such a journey sometimes requires patience, faith ... and so on. Using the Tarot is not just about interpreting, or at a worst-case just 'looking-up', the individual cards in a list of tarot card meanings. It is about learning to feel and appreciate the message of each card in its particular context. That includes being able to tune in to what the card signifies for a specific sitter (person), in the context of that person's question at that moment in time, based in part on the particular position of the card in the particular spread in which it appears, and so on. Do enjoy studying the descriptions on these pages but always appreciate that the message of each card varies according to many factors. It is the sensitivity of skilled readers that really gives true meaning to these beautiful little works of art and wisdom that we blithely call "tarot cards". Are there any short-cuts to learning the List of Tarot Card Meanings ? There are four tarot suits which, together, form the Minor Arcana. These suits have slightly different names in some tarot decks. The most common names include the suits of Cups, Pentacles, Swords and Wands. There are ten numbered cards in each suit, from the ones (equivalent to the "Aces" in standard playing cards) through to the Tens. There is also a King, Queen, Knight and Page of each suit. In addition to the Minor Arcana there is also the Major Arcana which consists entirely of 22 named picture cards. Not surprisingly, all of the members of each suit have certain associations in common. Similarly all the cards of a specific number or character, such as the Queens, have characteristics in common. 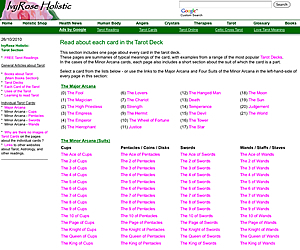 Knowledge of these systems simplifies study of the list of tarot card meanings considerably. The Major Arcana is even more interesting because the sequence of 22 cards from Card 0 - "The Fool" to Card 21 - "The World" tell a story which is usually called something like "The Fool's Journey". Who defined the List of Tarot Card Meanings ? Tarot Cards and Tarot Decks have been around for hundreds of years. It is likely that the system familiar to Tarot Readers today has developed over time, at least over several hundred years. No one individual has been credited with designing or defining tarot in general, though the artists of specific decks do provide valuable information about their own creations and artistic representations of the energies of the tarot. This is one of the reasons why study and use of different tarot decks is so very interesting. See also Books about Tarot for further information. - Article added 26 October 2010.